Zlatan Ibrahimovic may face suspension for making a lewd gesture towards Manchester City players during last week’s Manchester Derby in the EFL Cup, as per French news outlet Le Parisien. The Red Devils faced their cross-city neighbours for the second time this season, and it was Jose Mourinho who came out on top this team, as his men beat Pep Guardiola’s City 1-0. Spaniard Juan Mata scored the only goal of the game, with star striker Zlatan Ibrahimovic providing the assist. However, it looks like Zlatan could have landed himself in trouble, due of some of his actions during the Cup match at Old Trafford. During the 90th minute of the game, the Swede was involved in a banterous exchange with Manchester City duo Willy Caballero and Nicolas Otamendi. The new United man prevented them from taking a freekick by obstructing the ball, and was therefore shown the Yellow Card by the referee. During the exchange of words between the three players, Ibrahimovic was also seen holding his crotch whist smirking and uttering something towards Otamendi. Due to his actions, Zlatan may now be handed a possible suspension, as per French journalist Julien Laurens’ report in Le Parisien. So far, there has been no official comment from the FA regarding this incident. Even if the former Swedish captain does get suspended, however, he won’t be largely missed by his team, given his poor form at the moment. 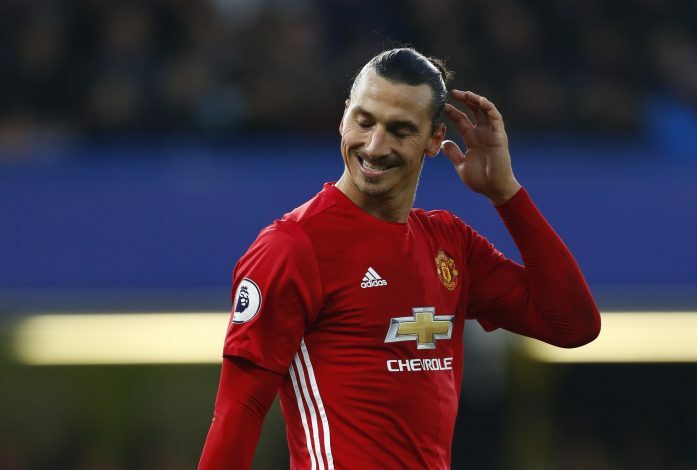 The decorated striker has failed to score in six consecutive league games – something that hasn’t happened with Zlatan since December 2007.